Watching the news from London, it would be easy to think the EU’s deal with Turkey on refugees is a simple trade-off: three billion Euros, visa free travel and the reopening of EU accession negotiations for Turkey in exchange for stemming the flow of the hundreds of thousands of men, women and children who have been arriving on Europe’s shores via Turkey. But spending a week speaking to asylum seekers and nongovernmental groups in Turkey made clear that the situation on the ground there is complex, and that Turkey alone is not the answer. Though it doesn’t recognize them as refugees, Turkey provides most of the more than two million Syrians living there with temporary protection that allows them to get medical treatment and education. Earlier this month, the Turkish government announced that it would give work permits to Syrians who have been in Turkey for over six months. But important as that step is, giving Syrians the right to work is unlikely to deter people seeking protection in Europe or risking their lives in the process. The deaths of more 40 people - including 17 children - when their boats sank in the Aegean last week makes that clear. First, these measures only benefit Syrians. Though the largest group, Syrians are not the only ones crossing into Europe. In Turkey, Hungary and the Western Balkans, I have spoken to Iraqi Yezidis fleeing the horrors of ISIS, Afghans who had received death threats from the Taliban, and Ethiopians who fled human rights abuses at home. They will continue to need protection as long as the reasons that push them out of their own countries persist, but around 100,000 Iraqis, more than 45,000 Afghans, and almost 15,000 Iranians in Turkey don’t have temporary protection or access to the benefits to which Syrians are entitled. Second, despite efforts by the Turkish government and many Turks to help, the situation for Syrians in Turkey remains dire. Up to 400,000 Syrian children are out of school because their families cannot afford school supplies or transportation or encounter language barriers or widespread discrimination against Syrians in Turkish schools. Registered Syrians also have the right to medical care in the town in which they are registered, but lack information about their rights and face discrimination. Workers in groups helping refugees spoke of Syrians being turned away or treated with contempt in schools and hospitals. Hopefully, work permits will help many Syrians to benefit from the protections of legal work and will be an important step toward ending rampant child labor of Syrian children who work to support their families. But, as with formal access to education and health care, barriers to employment are likely to persist and many Syrians are likely to remain marginalized. If it is properly disbursed and reaches the intended beneficiaries, the three billion euros could help make life a little easier for Syrians in Turkey. But with widespread prejudice against Syrians, the priority should be ensuring that the Syrians in Turkey can actually get jobs, health services, and education there. 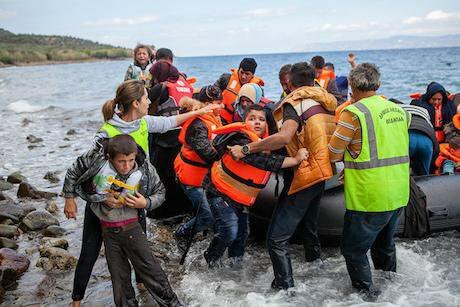 Expecting Turkey to host ever greater numbers of Syrians and other asylum seekers when it has not yet addressed these issues will only exacerbate them, and people will continue to turn to smugglers to bring them to Europe. With no end to the violence in Syria, Afghanistan or Iraq or to human rights abuses in many other refugee-producing countries, EU governments should not turn their backs on the people risking their lives for protection. Last year, EU member states agreed to resettle about 22,500 refugees from Turkey and other first-asylum countries, but by the end of 2015 had admitted only 779. The EU cannot expect Turkey to do more when its members do so little to share responsibility. As they sit in Brussels, Berlin or Copenhagen, EU leaders should ask themselves: what would I do if I had to save my family from bullets and bombs, and where would I go for my children’s future? I’m sure their priorities would be the same as Nabeel’s.